Tunisian rabbinical author; lived at Tunis and died there in the middle of the nineteenth century; son of Nathan Levy. He was originally from Gibraltar. 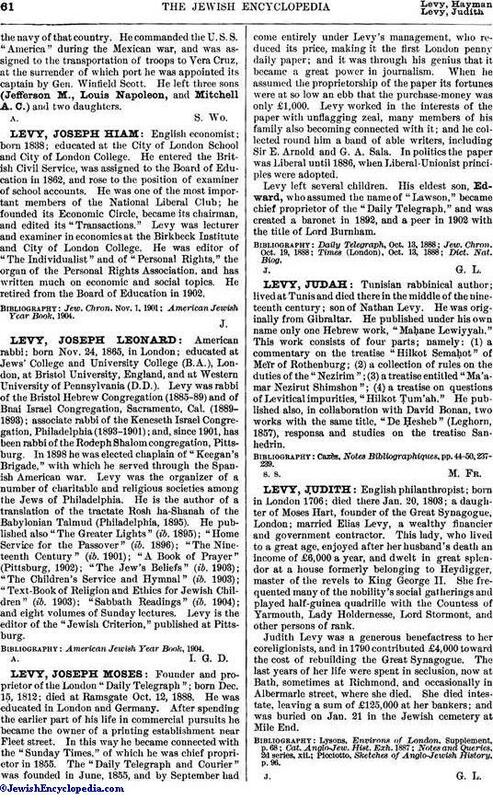 He published under his own name only one Hebrew work, "Maḥane Lewiyyah." This work consists of four parts; namely: (1) a commentary on the treatise "Hilkot Semaḥot" of Meïr of Rothenburg; (2) a collection of rules on the duties of the "Nezirim"; (3) a treatise entitled "Ma'amar Nezirut Shimshon"; (4) a treatise on questions of Levitical impurities," Hilkot Ṭum'ah." He published also, in collaboration with David Bonan, two works with the same title, "De Ḥesheb" (Leghorn, 1857), responsa and studies on the treatise Sanhedrin. Cazès, Notes Bibliographiques, pp. 44-50, 237-239.